This Orlando area villa has 4 bedrooms, 3 baths and a private pool with a large extended pool deck. The villa is fully furnished and beautifully decorated. It has central air conditioning throughout and is well equipped with all the amenities you could possibly need in your own home. Outside the villa, there is a private swimming pool and a large pool deck with ample space for dining and relaxing. The pool can be heated and the pool area is screened to protect you from insects. The villa is located in the exclusive gated community Solana, which includes a clubhouse with a gym, games room, sand volleyball court, putting green, playground, and many other facilities. Solana also has an attendant at the gate 24/7. It is fast becoming the most sought after community in the Disney area. 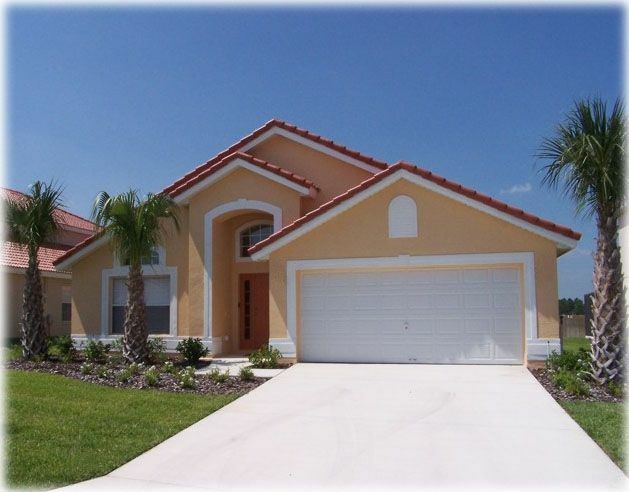 The villa has a luxurious, yet welcoming and homely feel that makes it perfect for a vacation in Florida. Our spacious villa will easily sleep 8 people. Overall, a really good week. We are a family of 4 and stayed a week without any issues or problems at all. We really enjoyed the pool during the day and hot tub at night. There are plenty of bathrooms for the whole family and we had 2 more adults join us for part of the trip, and there was plenty of space for all. And dealing with the owners was a breeze. Any and all enquires were answered very quickly, sometimes within minutes. Great location as well for the kids being right across a very quiet street from the park and club house, a 5 min drive to Publix, and 30 mins to Disney. To make this a 5 star property there would need to be more than 2 loungers. But a very, very nice place to bring your family on holiday. We enjoyed the home, it was safe, clean and well maintain, closes to many stores. But nowhere near Disney. This property is not in Orlando as posted, but in Davenport. time for traveling to and from Orlando. Gated, Nice Living Space, Close to Stuff! This house is probably one of the smallest in the gated community, but certainly served our purposes well. The bedrooms are nice size with plenty of room to sleep at least 8. We had three of us in for a conference. The 3 bathrooms made it nice so that each person had their own. Our only "ding" is that the beds themselves were a bit rough to sleep on - not much support. It's a one-story with VERY high vaulted ceilings so it felt much bigger than it was. Checking in and out through the guard gate gave added sense of security and was very easy to do (of course, me driving my orange Charger made us easily recognizable, so there is that - haha!). The location worked well for driving to/from the OCCC, Disney, and Universal. The owners/managers were VERY helpful with communication about the site, expectations, etc. My only suggestion is that check-out procedures include what to do with the key/code. I wasn't sure if I needed to try to reset the box or just put the key back in, etc. I would definitely stay here again! Wanted to escape the cold of New England, so brought the family to Florida for the holidays. Villa is clean, comfortable, and spacious, satisfying all our needs. Our 2 teens loved hanging out in the private pool in the evenings (instead of being glued to their phones!). We've taken them to Disney before, but this time they were excited to check out the new Avatar rides at Animal Kingdom. They're old enough now so we just dropped them off at the parks in the morning and picked them up in the evening, so us adults didn't have to stand in line all day with them. Definitely glad the house is close enough to Disney to make some short trips. Gated residence with swimming pool, hot tub, spacious quarters. Would definitely come back! The villa is located about 15 minutes away from Walt Disney World, where you'll find the all major theme parks of Disney (Magic Kingdom, Epcot, Animal Kingdom, Disney MGM Studios, Blizzard Beach and Typhoon Lagoon), Downtown Disney and more. Sea World is only about 20 minutes away and Universal Studios is also nearby. The Champions Gate and Reunion golf courses are close to our villa and there are lots of shopping places, grocery stores and more. Once you get on the I-4, you can drive to any of the major theme parks with ease (even without directions). * Holidays rates: Easter, Independence day, Thanksgiving, Christmas, New Years -- $149/night $999/week. * $90 clean-up fee if less than 7 nights, 12% FL Tax and $200 for security deposit. * $25 per day for pool heating fee (if needed).